Our Church School uses Living the Good News by Cokesbury, a lectionary-based curriculum. Children hear the same scripture in Church School that parents hear in the service. Our “whole community” approach to Christian education provides a shared experience of God’s word in liturgy, education classes and at home. Weekly lessons include a getting started activity, the Gospel story or a reading from the Bible, and prayer. Art, music, dramatic play and games enhance your child’s learning experience in the classroom and allow us to meet the varied learning styles of our children and to deepen their experience of scripture. Teachers are provided with weekly Leader Guides for an organized, structured learning experience. Student materials include summary ideas and activities for further reflection. Children in PreK and Kindergarten attend classes in the Good Shepherd Room with our dedicated and trained nursery staff. Young children benefit from a consistent, nurturing experience with our staff who each week share the Gospel story and incorporate games,music and crafts to enhance your child’s Biblical understanding and spiritual development. Students in grades 1- 5 attend classes in our Christian Education wing. Lessons are age group specific and offer a variety of engaging activities. 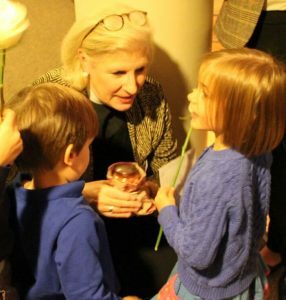 Before the sermon, the children follow an acolyte to the Christian Education wing to attend “Word Alive,” where they hear stories and do activities related to the week’s scripture readings. They return to the service at the Peace in order to participate in Holy Communion with their families. On the first Sunday of the month, the preacher also offers a short Children’s Sermon before the children leave for Word Alive.